There are more opportunities than ever for community members to step into civic leadership positions. With shorter legislative term limits, multiplying city and county board and commission openings, and an increasing call for more diverse voices at tables of power, you can play a critical role in shaping your community and defining its priorities. With Civicize.Me, you will expand your knowledge, build new skills and harness the power you already have to meet this opportunity through a unique blend of training, networking and exposure to the inner workings of civic institutions. CIVICIZE.ME OFFERS FOUR UNIQUE PROGRAMS FOR ADVANCING CIVIC LEADERS. For each program, the Civicize.Me training format incorporates optimal teaching techniques for adult learners, is highly interactive and draws on the experience and knowledge of participants. Our place-based approach treats participants as experts on their communities, while also expanding their civic intelligence. Civicize.Me alum from any program are invited to join a private Facebook group to stay connected, continue learning from each other, and share ambitions, actions, opportunities and civic successes across communities. Our 3-hour Backyard Civics 101 seminar provides an introduction to civic institutions in your state. The session includes historical context for our multi-layered government structure, briefly charts the branches of federal and state government, then focuses on demystifying your state’s county, municipal (city, township, village, etc.) and school district systems. We help participants understand their own backyard governments and their power within them. Participants leave having identified at least one personal ambition for civic engagement and their next steps toward achieving that ambition. The 6-hour Civic Leadership Workshop is our Backyard Civics 101 seminar combined with exercises to help participants define the qualifications, expertise and talents they can bring to local government roles and decisions. Participants walk away confident in their ability to achieve their identified civic ambition. 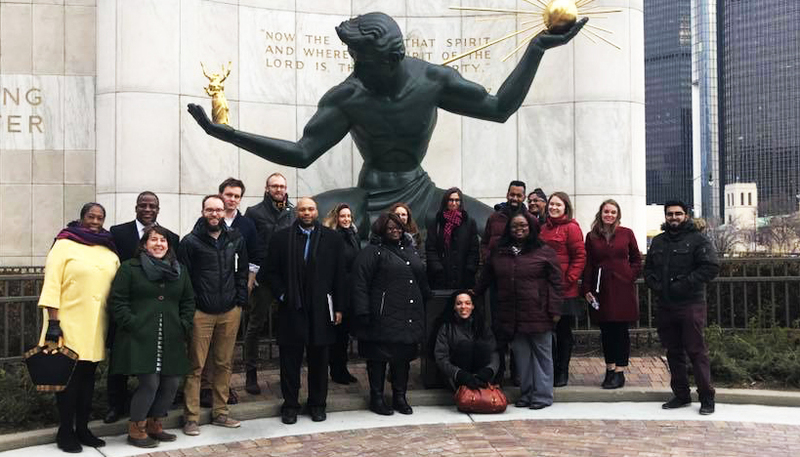 Our place-based Community Civic Leader Certification takes place over 2.5 consecutive days, and includes site visits to backyard civic institutions and the opportunity to learn directly from local government officials. Participants will receive a certificate declaring their civic leadership, and will leave with an action plan for achieving a civic goal. A “graduate level” version of our Community Civic Leader Certification, this package is Civicize.Me’s signature place-based learning cohort model. By the end of the 6-day program, participants will have a master knowledge of their local civic institutions, as well as a well-defined action plan and leadership skills for achieving their civic ambition. Participants will receive an official Civicize.Me masters certificate, a personal Intercultural Development Inventory, and a pre- and post-cohort Civic Leadership Assessment.